W3000 : electronic controller with Compact keyboard. It features an easy-to-use interface and a complete LCD display that allows consulting and intervening on the unit by means of a multi-lenguage menu, available in three languages: Italian, English and a further language among French, Spanish, German, Russian and Swedish. The alarm history display function can be enable by installing a real-time clock (optional). W3000TE : electronic controller with Compact keyboard. It features an easy-to-use interface and a complete LCD display that allows consulting and intervening on the unit by means of a multi-language menu (19 languages are available). The diagnostics includes a complete alarm management, with the “black-box” and the alarm history display for enhanced analysis of the unit operation. The programmable timer manages a weekly schedule organised into time bands to optimise unit performance by minimising power consumption during periods of inactivity. Up to 10 daily time bands can be associated with different operating set points. Both the controllers offer advanced functions and algorithms. The defrosting (reversible unit only) follows a proprietary self-adaptive logic, which features the monitoring of several operational parameters. This allows to reduce the number and duration of the defrost cycles, with a benefit for the overall energy efficiency. The full range is available with the Class A efficiency rating. 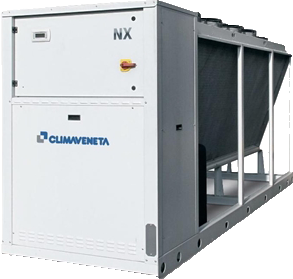 Thanks to the generous sizing of the heat exchangers and an accurate control of the fan speed, the CA versions grant a premium level efficiency in every noise configuration. The use of the electronic expansion valve generates considerable benefits, especially in cases of variable demand and different external conditions. It has been introduced into these units as a result of accurate design choices concerning the cooling circuit and the optimisation of operation in various different working conditions. The electronic expansion valve comes standard in the high-efficieny CA version, optional for the compact K versions. The optional built-in hydronic module already contains the main water circuit components; it is available with single or twin in-line, for achieving both low or high head. fins or Fin Guard Silver protective treatment.